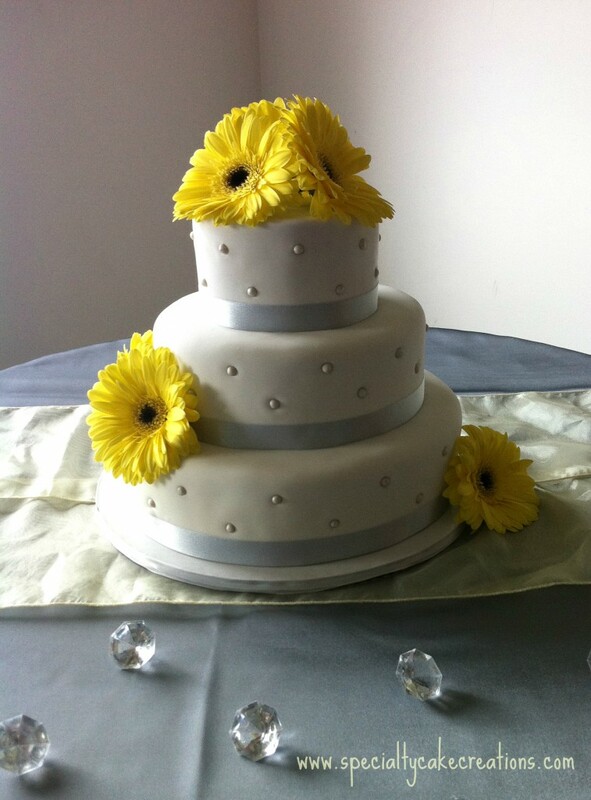 Fresh yellow gerber flowers highlight this 3 tiered wedding cake. The base of each tier is decorated with a light silver ribbon band. Sugar pearls dusted with a matching light silver decorate the sides of the tiers. The bride included a beautiful setup with silver and yellow table coverings and multiple glass gemstones. All three tiers were red velvet cake with raspberry buttercream filling. “Wow, your cake was awesome! It looked so nice. Some people had four pieces. We would recommend you to anybody who needs a wedding cake. with. They will provide you the best attorneys to represent your case.